A spindle which has grooves along two opposite sides and is threaded on the corners of the square. 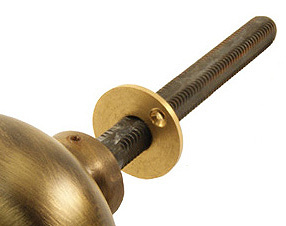 A knob is normally fixed to one end and the loose knob is threaded onto the other end. A grub screw in the neck of the loose knob locates into the grooves once it has been threaded to the correct position. Invented by Joseph Duce who patented it in 1842.